Learning how to calm your mind, relax, find stress relief, and drift into a deep sleep doesn’t have to be difficult. With this one hour deep sleep hypnosis accompanied by a relaxing music, falling asleep quickly is as easy as pressing play. Throughout this program, you will be guided from start to finish. We will begin with your current state of stress and bring you to a relaxed state of calmness, where you will be able to fall asleep easily to the music. 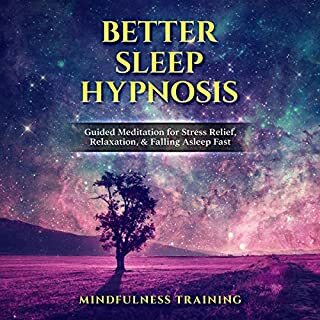 With this wonderful hypnosis, you can practice at home or on the go, learning how to de-stress quickly and easily. This does seem to help me fall asleep. Even on nights when I'm kind of stressed out, I haven't finished the whole thing and still been conscious. ;) The controlled breathing at the beginning is a little weird, though. Trying to fill my chest up in particular feels unnatural and not relaxing. I didn't know how to rate it as a "story," because it's not. And it's not *interesting,* but clearly that's not the point.